Sarah Alfarhan: 'One Year Of Daily Self-Portraits' project is DONE! 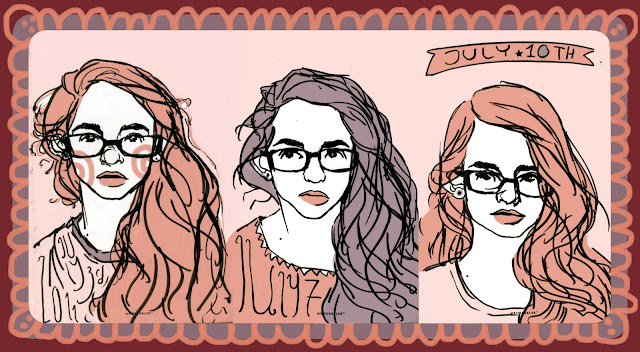 'One Year Of Daily Self-Portraits' project is DONE! I made it! My 'Self-portrait a Day' project has come to an end! Thanks to everyone for the encouraging words & support through out this project. It really means a lot to me :) the kind + encouraging words kept me going & lifted me up when I wasn't confident about my drawing skills. It was scary at first (I was overwhelmed) but after 2 - 3 weeks I couldn't go to bed without drawing a self-portrait. And it was challenging at times, through out that year I lived in 4 different places! Moving is always hard! And I learned a lot. And most importantly is that I didn't stop drawing. Before I graduated from UARTS I heard stories about recent graduates who have stopped drawing altogether & it simply terrified me. I didn't want to be in that place, I didn't want to cease doing what I am passionate about. I am happy with what I have accomplished, I wasn't sure I could do this project a year ago but I did it & it feels wonderful! I will probably keep drawing a portrait daily, maybe not a self-portrait, maybe just an object, or what I had for dinner! I will share these drawings every once in a while (probably only the best ones). To see all portraits from the day I started the project till Feb.10.2011 go here. To see self-portraits from Feb.11.2011 till the very last portrait go here. Way to go, Sarah. Diligence and commitment are great things.